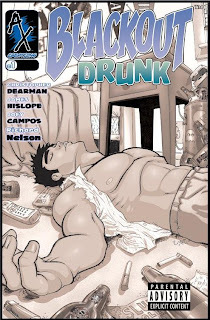 BLACKOUT SKUNK is a spin-off comic strip of the lovable stoners from the graphic novel: BLACKOUT DRUNK. Previously a re-occurring feature in Skunk Magazine, you can now find Miller & the gang 's crazy stoner hijinks periodically posted on the BLACKOUT DRUNK FACEBOOK FAN PAGE – where you can witness their quest for getting high and satisfying the munchies unfold in full glorious color. Buy Blackout Drunk swag here! Buy Blackout Skunk swag here!